Harmony: The Five Frequencies Saga Part 1 is a new Australian Young Adult fantasy film, hitting our screens this week. 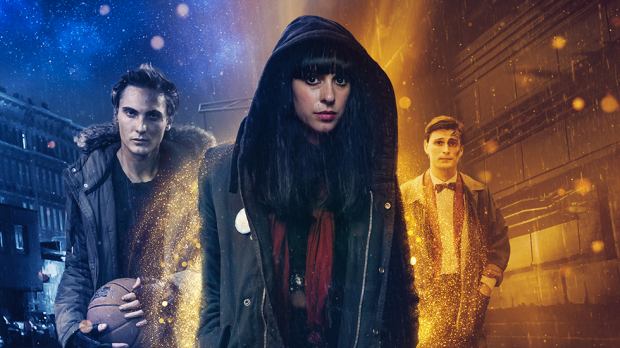 Following the empathic Harmony (the final role played by actor Jessica Falkholt) who is on her own course to discover her destiny as one of the five factors attempting to bring balance to an out of kilter universe. One of those that she encounters in her adventures is Mason (Jerome Meyer), a young man who may hold the ability to aid her, and a potential that even he is unaware of. DAVID O’CONNELL spoke to actor Jerome Meyer (Home And Away, Joe Cinque’s Consolation) about what it was like to play the mysterious Mason, and how fantasy was a change from his previous roles. What attracted you to Harmony: The Five Frequencies Saga Part 1? Firstly, at this stage of the acting career you don’t necessarily get to pick and choose the projects you go for, so when one comes along you take it! Aside from that, I am an avid fan of the independent film industry. I love the idea of big films being made on small budgets, especially the creative resilience and ingenuity that limited access to funding draws out of young filmmakers with big ideas. There is always more heart, depth, and grit in those spaces, and I love being surrounded by it. It’s the reason I am still in this game. So when this big scale fantasy thing came along that was shooting on a relatively low budget (as far as films go) I was excited to be a part of the process of pulling that off. Urban fantasy is a bit of a change from your previous film and TV experience. Did you have any familiarity with the genre? Did you like it? No, I have not had very much experience in urban fantasy, neither in regards to my professional creative life nor my personal artistic taste. My girlfriend (Adele Querol – who plays Iliza in the film) however has a huge guilty addiction to all things super natural and fantasy (urban or otherwise). So I guess you could say I have had somewhat of a ‘forced exposure’ to the genre. What I liked about acting within the genre was that I felt the constraints were looser on my ability to play with the character. Because the world is a little mystical, I could toy with these extreme emotional states and behavior, without feeling like I was falling outside the zone of believability. This was a very different experience to playing a real person who actually lived and interacted with a known world (as I did in Joe Cinque). How would you describe Mason? I think in his essence Mason is the personification of good intentions. He wants to live amongst and actively participates in creating a world that is all about giving and kindness. Ultimately however that is not the world we live in, and therefore he becomes somewhat inhuman when only existing through the guise of altruism and well intentioned actions – only one side of the coin. He is not ‘whole’ and in fact numb to the ebbs and flows real existence, until he meets Harmony. When we initially meet Mason, he’s very confused and insular, but he comes out of his shell and is more open under Harmony’s influence. How was it for you, as an actor, to find balance between those two aspects of the role? Playing those two sides of Mason was actually one of the most enjoyable parts of the process. There were these two distinct approaches for me, pre and post Harmony (it really helped thinking about it like this as it was of course shot completely out of sequence). Pre Harmony I focused on zoning into this almost meditation like state , and only responding to the input immediately present before me. No emotional baggage or subtext, nothing. Just presence and responding with minimal effort or energy expense. Like a robot I guess. Then once Harmony came along it was an absolute free for all. I could fire on all cylinders emotionally and nothing was too big. I remember one take, I actually was just trying to be so emotionally random, to see if I could make Jess laugh, and Corey pulls me aside and said “that’s it, that was the one”. I can remember thinking, “anything goes for this guy” because he’s discovering this all for the first time, like a child. From then on I invested in that kind of irreverent play, even if the emotion was on the darker side. I just committed totally to see how far I could take it. With all the extensive night shoots, and working a lot with water, were there times when this was a challenging shoot? Totally. It’s always a little more difficult when working in the extremes – the black goo was the worst! It was like this weird, off smelling corn syrup stuff, and we had to lie with our faces in a puddle of it for so long! When it gets hard that’s when your sense of humour has to come in, and you just laugh at the absolute ridiculous nature of the situation. Like me; sweaty, tried and freezing, carrying Jess down the beach over and over again screaming the name “Harmony!” at the top of my lungs. You kinda have this out of body experience, like “this is me now, this is my life”. It really helps when the cast you are working with are laughing with you. And sometimes, if you are lucky, that wry enjoyment shows up in the film and then you have a saved memory of it forever. Is there a lot of back story threaded into Harmony, that we’re only seeing the “tip of the iceberg” so far? This I do not know. Corey (writer/ director Corey Pearson) has kept me relatively in the dark in regards to how all of these elements are going to come together in later films. Which makes sense, because Mason doesn’t know yet either. I do know that there is a huge emphasis on the play of universal signs and coincidences, pointing us towards our true potential. I think the following films will continue to strengthen that trope and possibly even have characters who know how to directly read or harness that power in some way.